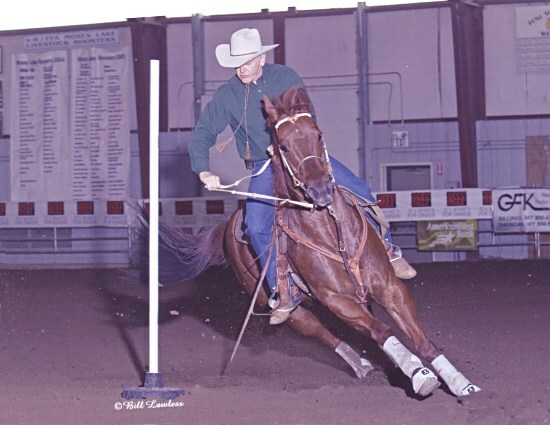 Why is it that pole bending is such a challenging event for riders and horses to learn? As with every equine activity, it's all about horsemanship! Pole bending is by far the most complex and challenging of the speed events, with ten lead changes and three turns, each separated by only a heartbeat of time. We call it precision dressage at speed. It's a high speed dance, with the rider leading, but so together that they appear as one. The requirements for success are knowledge, athletic ability, skill, and desire. Realize that they all apply to both the rider and to the horse! 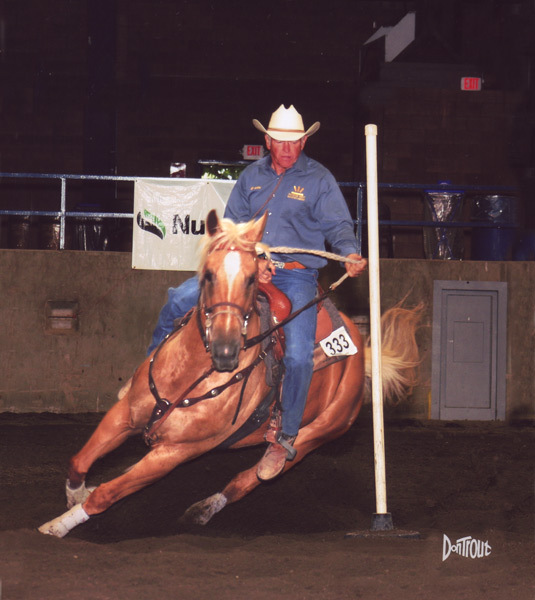 Think of pole bending as a partnership; but it is up to the rider, as the leader, to ensure that all the requirements of both horse and rider have been met. We attempt to address all of these requirements at our clinics. We use a proven teaching format that gets results: Hear it, See it, Do it, and Feel it! Visualization is an important aspect of learning the mechanics of any sport. We start with knowledge. We explain the event in detail, using diagrams and action videos. A rider must understand what they are trying to do, and then the rider must become a trainer and show the horse. We use a video and presentation format to initially introduce the technique, then drills are employed that specifically target the key aspects of the event. When it is wrong, know what to do to fix it. Please note that we have a video available in a two DVD set that covers all the same information we teach at our clinics, and includes examples of the drills we use which we feel are an important part in training success for both horse and rider. Included are examples of correct technique and also problem analysis. Several high speed pole bending runs are also included. It is all there, and you can use it as an introduction before attending a clinic, and as a review after. You can order the DVD Set here. 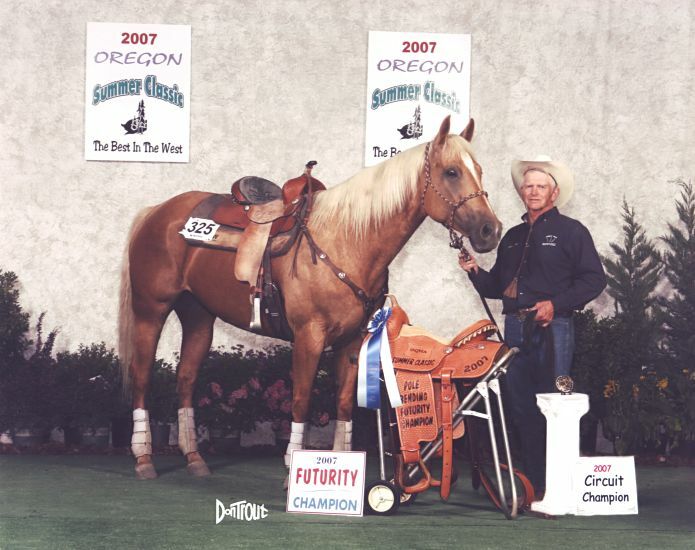 When my wife Pat and I began breeding, raising and training horses specifically for barrel racing and pole bending, we planned that I would start the colts, and then Pat would be the one to finish them out and take them through the barrel futurity year. 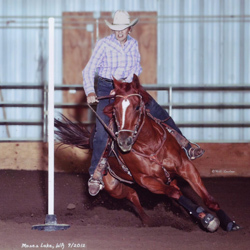 We have always been strong believers that poles are good for a barrel horse, but I began looking for ways for our pole work to become more than merely barrel horse preparation. 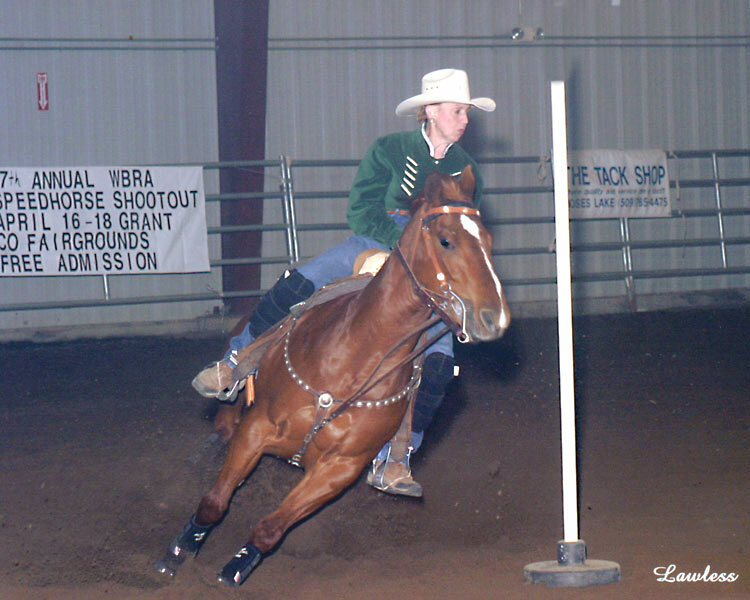 I set out to improve our pole bending technique so that these well bred horses could excel at this event. I searched for information on pole bending and found very little available. There were a couple of videos, but they proved to be quite superficial. Then I found Wayne Sandberg's book, Nineteen Second Pole Bending, and I was impressed with his detailed analysis of the event. We became friends, and the knowledge I gleaned from his writing and his coaching really helped me on my way. My experience with the successes and failures of competition in those early years helped me to refine my technique and make it my own. 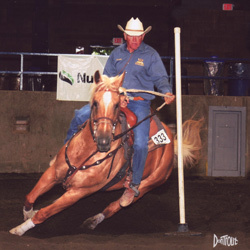 I regularly use several of the drills that Wayne originated, while others I've developed on my own, resulting in a set of exercises, drills, and horse handling techniques that work for me, and I have successfully applied them to several horses that have developed into top performers. 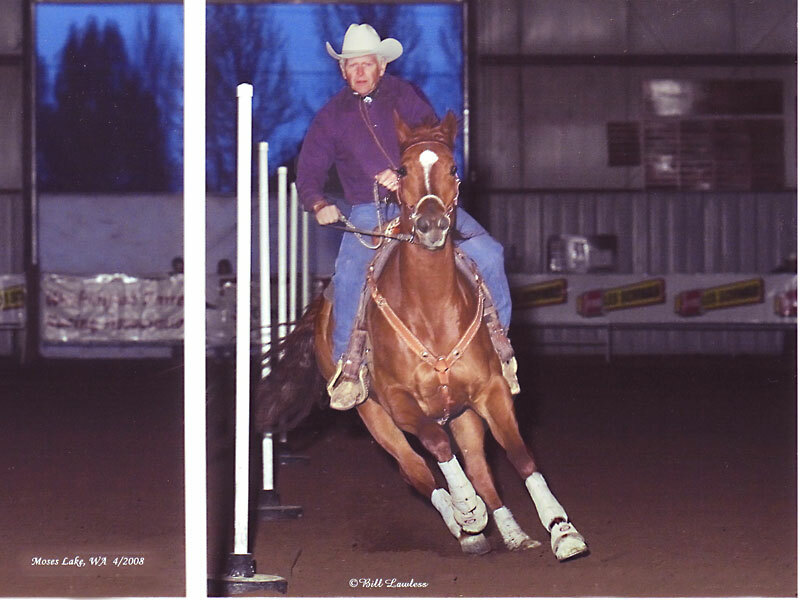 Over the years I have made many trips to locations all across the country to watch the toughest pole bending competitions and to exchange ideas and ride with many of the best riders and trainers in the game. 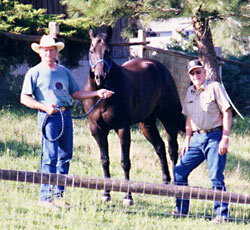 I continue to compete, and you can see us and our horses in competitions throughout the western US. The clinics evolved from my personal struggles to master this event. Let's face it: pole bending is a complex event and things happen fast! What is needed is a way to present the details and techniques to students so that they can quickly grasp the main points and be encouraged to work with their horses to perfect their technique. I've found a number of analogies and images that seem to help make it "click" for students. I have had great feedback from the clinics, and we have seen some real success stories from many students. For a brief sample of the technique we teach, start the media player below. For a quick video of Nicky making a 20.2 second pole bending run, start the media player below. The typical clinic format is two-days, using an early morning start on both Saturday and Sunday. As an option, clinic hosts can elect to have the first lecture and video session on Friday evening, which allows more riding time on Saturday. I like to have between ten (10) and twelve (12) students, and fifteen (15) students is an absolute maximum number. More than that and we get too much waiting. We have had several successful clinics on weekdays! It is one way to avoid conflicts with rodeos and other contests. We have other options for instruction for smaller numbers, and for returning students who are looking for a refresher. Please contact us for more information on these options. The first session is a lecture and video review. 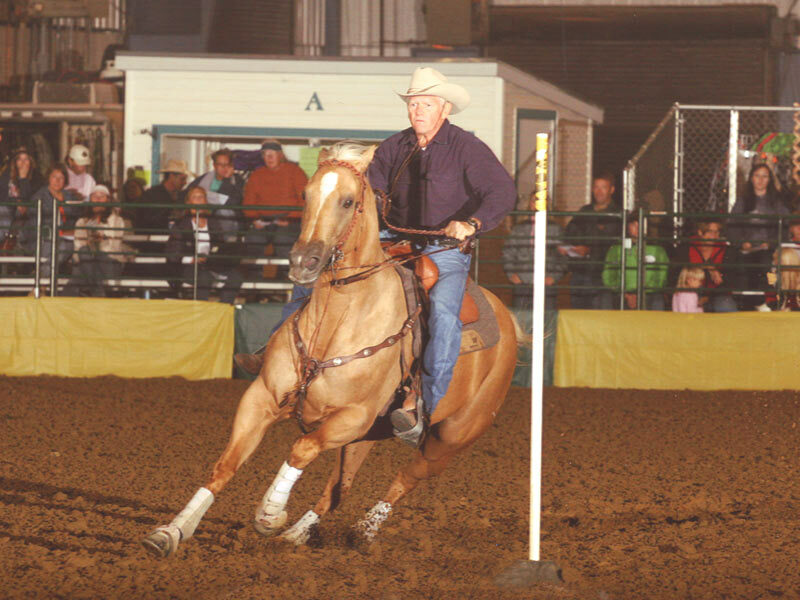 I explain the method and the horsemanship behind the method. We watch videos of it being done right, and done wrong. Students are invited to bring their videos for review. The first thing we do on horseback is to make a pole bending run. If the students are active competitors, I want them to show me a competition level run. If the student has a horse that is new to poles, then I'd like them to show me where they are in their training. This helps me to see how far along they are, and where they need to go next. The next session is designed to demonstrate the foundations for speed event horsemanship. 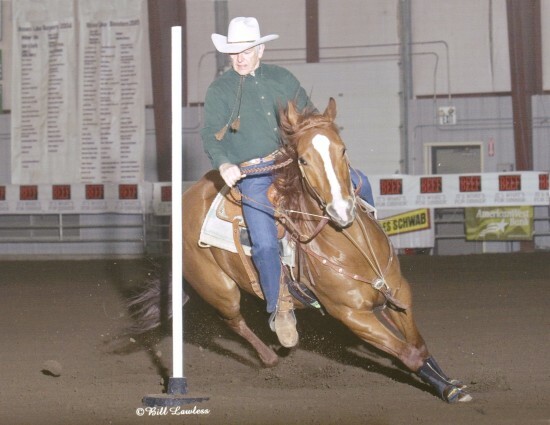 We cover flexion, reins, and leg aids, as they relate to speed events. We cover rider positions - position-right, position-left, hand positions, leg positions, body position. We let the rider "feel" the positions and the aids working. Everything else builds on this. For all of the sessions we ask students to bridle up with whatever bit or hackamore they normally use. We'll watch the horses to see if the head gear is effective. The bending session starts with anatomy of the bend, the zig-zag slalom pattern, the hips-out, shoulder-out position of the horse, application of position-left, position-right, working with the "crooked" horse - one that flexes on one side but not the other, and the connection between the turns and the bending segments - why a successful bending segment is critically dependent upon the proper completion of the preceding turn. There is a speed building exercise that is designed to boost the confidence of both horse and rider. The success of this exercise never fails to impress both students and observers. 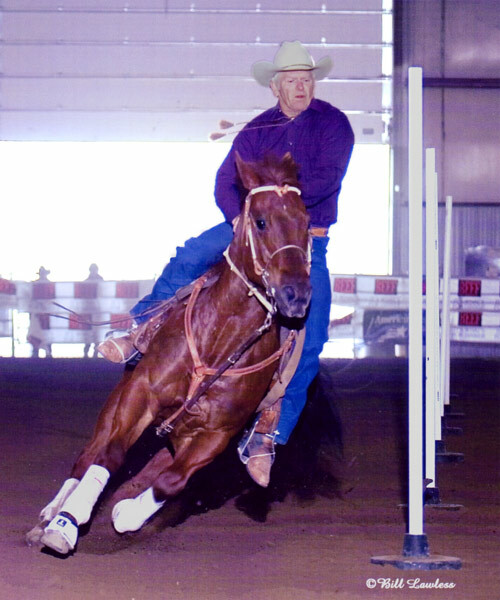 The session on turns includes the anatomy of a turn, where we teach the basics of the three-pivot turn, preparing the horse for the turn (the most neglected part of successful pole bending turns), rider position for the turn, applying basic horsemanship, properly finishing the turn, the importance of the "look with your body", and avoiding being "behind" the horse. 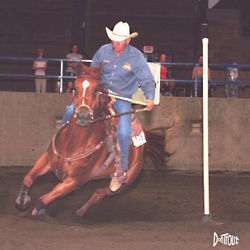 During this session, it is common to be working at a trot into the turns, and then having a horse begin to gallop out. Why? Because it feels good to them! Everything is right and they feel like they can! We talk about the run-down and the importance of speed. The first turn is similar in many ways to the other turns, but we also point out the critical differences, and we have a drill specifically for the first turn. For those who want to try a run, we can now put it all together. We don't use a clock. We watch for smoothness and the application of the methods. Please note that we can provide a certificate of insurance that will satisfy the requirements of your facilities management. The cost per student is very reasonable. Please contact the clinic host for more information. Click on a name in red for email, or use the phone number. If you don't see a clinic scheduled near you, then it may be only because you or someone you know has not asked. Send me an email at the address below and I'll forward the details and costs associated with hosting a clinic. So grateful for having Ken Smith come to Kansas for another one of his pole bending clinics. Don't know what we would do without him. Awesome participants, great ground and just a lot of wonderful learning occurred. Can't wait to have him back again. Thank you to everyone that came or helped make it possible. I just wanted to tell you that since we went to your clinic in Bowman, L. has shaved off so much time - she just ran a 21.3 today with so much room for improvement. 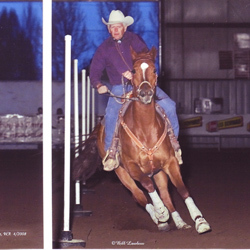 I am just amazed at how much improvement there was in that one clinic with this horse! Just wanted to tell you, Ken, that B. ran a 20.9 on Flicka last Saturday and a 20.86 this Saturday. This Saturday she took the last pole with her HAND trying to set it up. She had barely hit it and it looked like it was going to sit up on its own. She is still so happy that you can't wipe the smile from her face. They are going to do it. She is bound and determined. I am really amazed because even at 20 seconds, there are lots of places where mistakes are made and so I know 19 seconds is coming!!!!! I am so happy that you came out and the girls got to have a refresher with you! It has helped immensely. This is L. from Montana. I have attended a lot of your clinics and your last one I went to really clicked. I made it to nationals on a race horse I trained with your technique that had not been trained on poles for even a year. Now that I'm in college, pole bending isn't as important, but I still run him and he clocked his fastest today with a 20.2 (we tipped one) and last weekend we had a clean run of 20.6. I want to thank you because I would not have this kind of horse without your help. I also started my 4 year old on poles this fall and she has already clocked a 20.2 - it's all because I took what you taught me. We’ve been in Guthrie, OK all weekend at an event and thought you might want to know how it went. I couldn’t wait to get home and email you about C’s runs! She worked her horse slow last week keeping him round and using your techniques. She ran a 20.311 and a 20.374!! That is a personal best for them. The fastest time she’s ever run has been a 20.408 with a hit pole. He ran very honest all weekend. His end poles were still a little deep, but more round and better overall. We can’t thank you enough for sharing your knowledge with us and taking the time help. We really appreciate it! 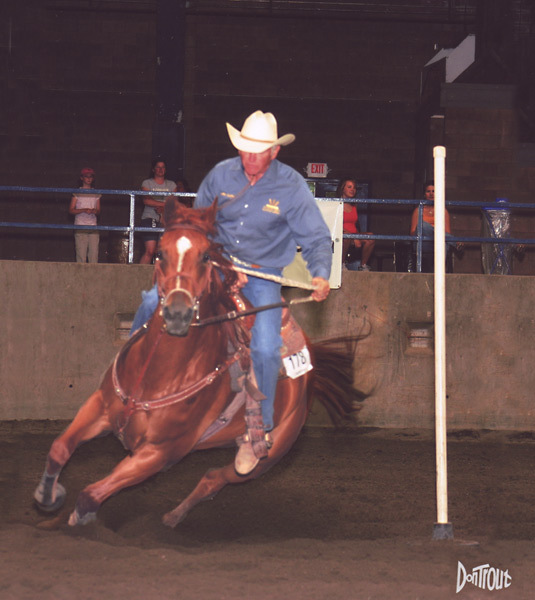 "I knew I had a good horse for pole bending, but you helped me with the technical movements that really made the difference for winning. Thank you Ken for all of your help over the years!" We are so happy you came to help. She feels so good about all the things you taught her, and can't wait until she gets a chance to show them off! We all loved the clinic Ken, you are really a great teacher. You add the why factor and that clears up so much, I heard this comment all weekend. We loved having you and I really do hope we can bring you out again soon. J's final run last night made it all worth while for her so she is a big big fan. What a wonderful experience for the girls and parents. Thank-you so much. We are looking forward to spending time with you again. I was reading the feedback about your clinics and thought that I should pass on a little more information. Your clinics and your assistance have actually led to the 2008, 2009 and 2010 pole bending Champions for the BCHSRA (British Columbia). All three of these young ladies have attended at least one of your clinics and were then able to experience the ultimate success of becoming the Champion. 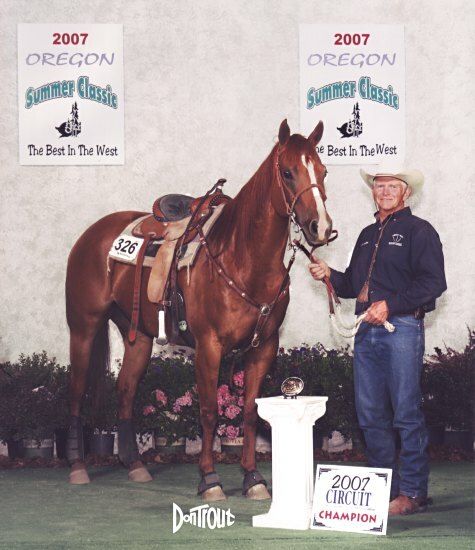 I also have to say that I have learned a great deal from your clinics and put your ideas to use on every horse I ride. They all learn to run poles and pick up the technique very quickly. I hope to attend another one of your clinics next year perhaps as I have a couple of young horses that could use the help. Our daughter attended your clinic at Spearfish, South Dakota. She learned a lot as we did also. She took home what she learned and used it on her good little quarter pony and had 20 second pole runs consistently all summer long. 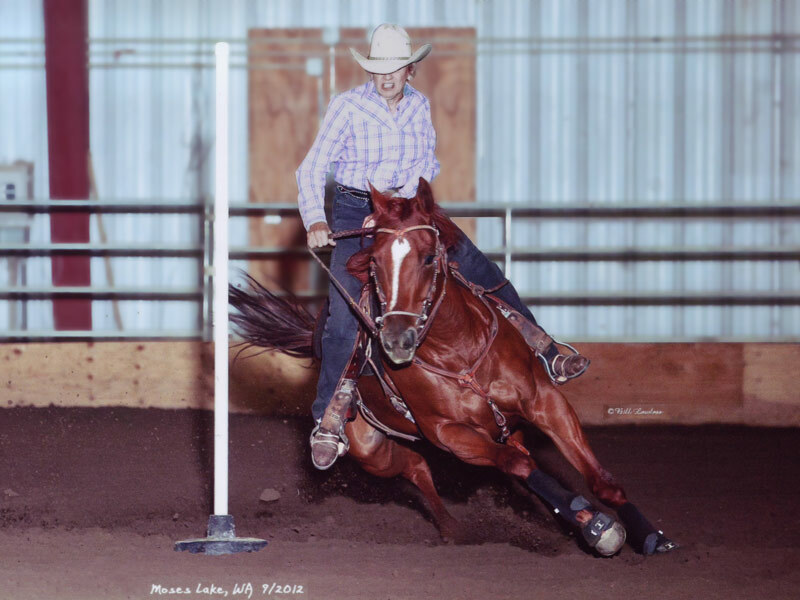 She was the state champion pole bender for the Jr. High in Nebraska, and she finished fourth in the world in National Little Britches. ... we have been to the Wrangler Jr. High National Finals. Nationals had 38 States, 5 Canadian Provinces and Australia represented. The top four kids from each State/Province could come in each event. H. has been working hard to institute your techniques in order to fix her end poles for the last month. The results were she became the State Champion Pole Bender and she became the Reserve National Pole Bending Champion. We appreciate your in-sights and depth of knowledge that helped us take Pole Bending to the next level. Dear Ken, Just wanted to tell you how much we got from attending your clinic in Spearfish. It was awsome. It was better than I imagined it could be. Pole bending is very detailed and I kept wondering how you could 'properly' teach it to the kids. You did a very good job, and your passion for the subject got everyone's attention. As an adult, I learned A LOT from watching the others receive your help. I know I can do better after learning your concepts. We wanted to thank you for working with S. and helping her to achieve her goal of being the British Columbia High School Pole Bending Champion in her Rookie season. Without a doubt, your coaching was so important to her year long success. The precise way that you analyzed both her and her horse then helped both to make the necessary adjustments was in my opinion such a huge part of her meeting her goal for the season.